The forecast is hard to read as it’s still a few days until it will hit us. We are on the western side of the country and it moves in from the east. Per today at 10:00 it’s winds with close to 200 km/h speed and more in the gustings. It’s not to Yolanda strength yet but it’s steadily growing tougher. How it will effect us is impossible to predict. Will we be able to cross the little strait back to Luzon and Manila? Will the plane leave to Myanmar? We don’t worry about those details yet. Worrying is good for nothing. We can’t change the winds, only prepare for eventualities. We started this morning with a morning training session. With five runs up and down the stairs and tabata including burpees, push ups, back ends, lunges and more. I was first up the stairs but had to return all the water I had been drinking before training. But hey, it’s All or nothing, right? We get good breakfast with fresh fruits and muesli with milk before heading out to sea. We are going snorkeling today. We enter a boat and head towards Coral Gardens. 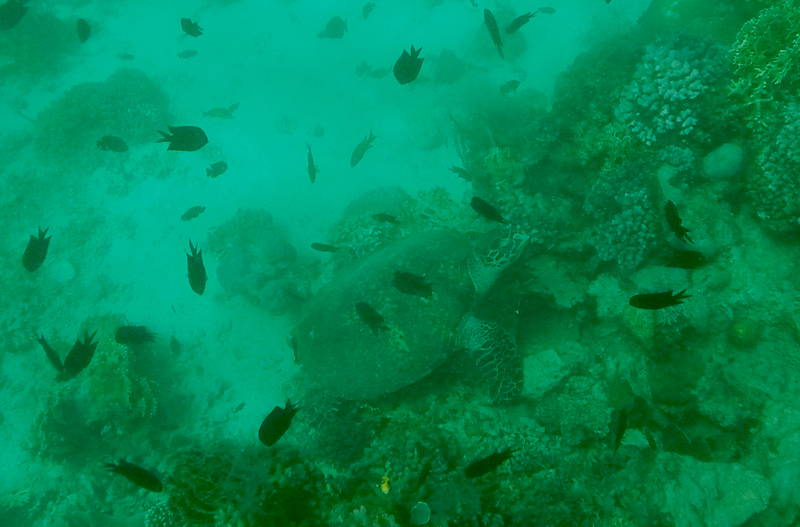 We had no great hopes for the snorkeling as Sabang really is a divers paradise. There’s a lot of great dives around here, but we just wanted to take a tour and experience something else. can then hang on to the rails and get dragged around the area for a few pesos. 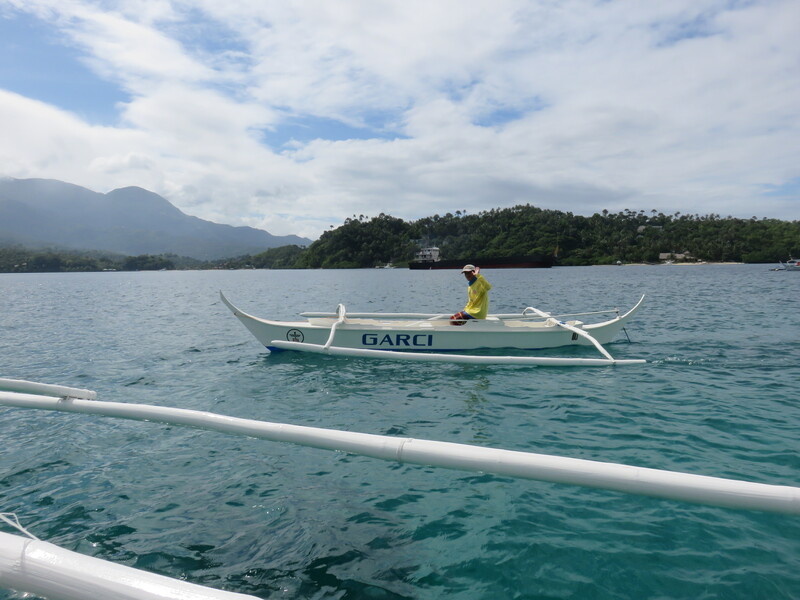 We made a deal with one of these small crafts and was towed around watching the corals and fish. It was just brilliant. Getting an instant snorkeling experience worked really well. Along the tour he stopped and we swam around on our own. At one point he produced some bread and have to us. The video under show what a feeding frenzy that emerged from that. And let me tell you that these fish don’t see all that well, at least that’s what I use as an explanation for all the biting in my fingers. The nibble and it’s not painful when one do it, but when fifty at a time misses the bread and gnaws on your fingers it’s “sharply ticklish”. Moving on from the fish we encountered not one but two turtles. These magnificent creatures just glide through the waters. They’re built like a lump of wood with broad shell and not to mention the loafers the use for swimming. The difference of seeing a turtle on land and in the sea is nothing but breathtaking. The first on came gliding up in Katja’s blind zone and just emerged to the surface to take a quick gulp of air before diving again. The second was at the bottom feeding in between the corals. Then it slowly pushed of from the sea floor and started rising and moving away. We were thrilled that we got to see these two beautiful creatures. Fidel took us on the Long Beach for a bath and some beach time. The beach looked extremely nice from out at sea, but it was filled with small stones and not nearly as nice up close. We spent a little time there and I did a little snorkeling also, but it was really not exciting after what we just had seen. We headed back home and got to our room and ate the leftovers from yesterday’s dinner. 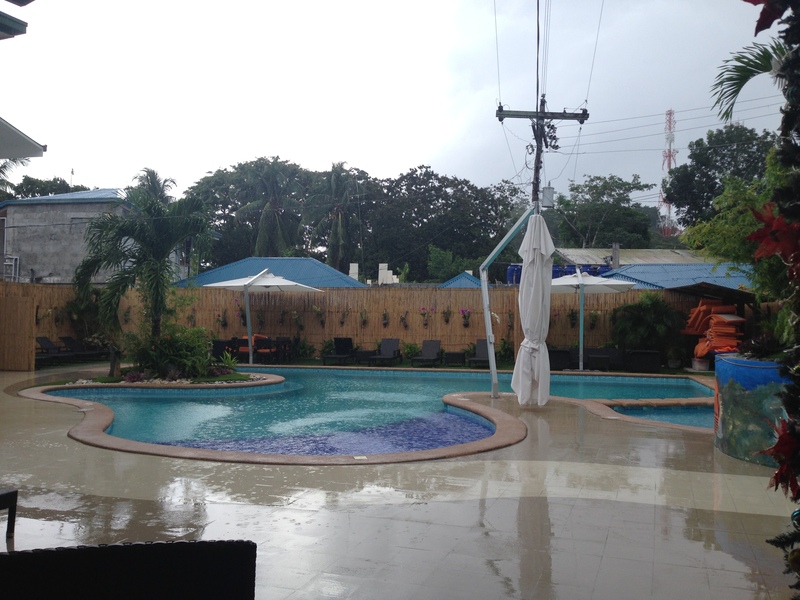 Now we’re sitting under a large umbrella down by the pool in a trickle of rain. The temperature is great and we’re enjoying ourselves, but the sun seems to be gone for the day. The rain got more heavy and we had to move under roof to avoid the splashes. We sat there for a while til it stopped and then we skyped with Katja’s dad and my parents. Now we’re down for dinner and have spent the last couple of hours trying to reschedule the next weeks. We will leave this island in two days time. We talked to someone who lives here permanently and they say the island will be shut down when it hits. That would be bad. To make sure I type faster and with better precision I have installed Swype keyboard on the phone. Hopefully I will get quicker in writing this texts. So far it’s working surprisingly well. So far it’s been like this: if I write ash half speed I write twice as fast since I don’t have to correct so many typos. I’ll let you know how’s it pan out. If you want to conquer fear don’t sit home and think about it. Go out and get busy.